Karen Mok is a Chinese super star – as a singer as well as an actress and has won the Golden Melody Award, which is the Taiwanese equivalent to the Grammy, 3 times. Her 2013 album in English, ‘somewhere I belong’ was one of the last projects I did before leaving Universal Music and one I am particularly proud of, as it is simply a great record by a very good singer. Now her REGARDEZ world-tour brought Karen to Madrid to perform – being the first Chinese artist to do so under her/his name. 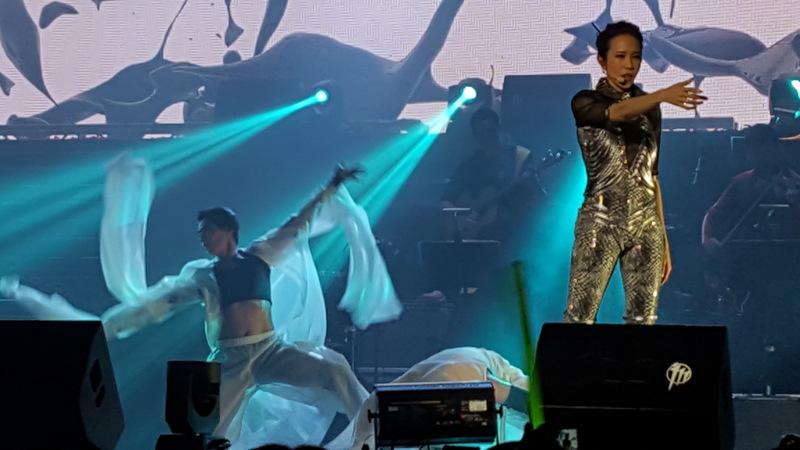 In front of a mainly Chinese crowd of estimated 2500 people, she performed songs from her Mandarin and Cantonese catalogue and the audience sang along with enthusiasm and seemingly enjoying the concert – even not understanding the lyrics, it was clear that these were great songs, perfectly performed by her nine piece band and with immaculate vocals by Karen herself. A fantastic light and video show – stylish and always in support of the music, not overpowering it – made the concert an overall amazing event, a feast for ear and eye. Absolutely great was when she did a song from the album we worked on together – her version of Wicked Game, which without a problem fitted the rest of the program, as well as Cheek To Cheek, which she had recorded a year back with Andrea Bocelli. Great music can come from any place on earth – no matter what the genre. Karen proved this at this show and with the jazz album I worked on. A true star … and a very nice person on top! 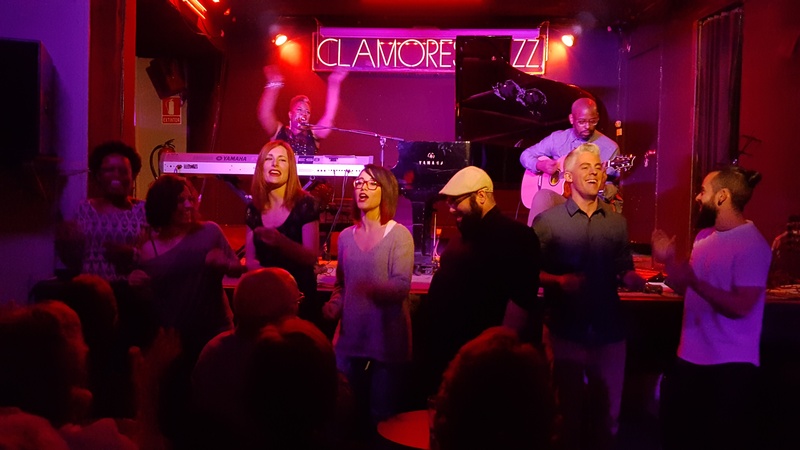 Friday May 6th the Soul singer and keyboarder Avery Sunshine performed as a duo with her husband, guitarist Dana Johnson, at Clamores in Madrid. Avery isn’t really that much known yet, but I bet this is going to change soon: a voice to die for, a great personality and a fantastic performer with a great sense of humour. 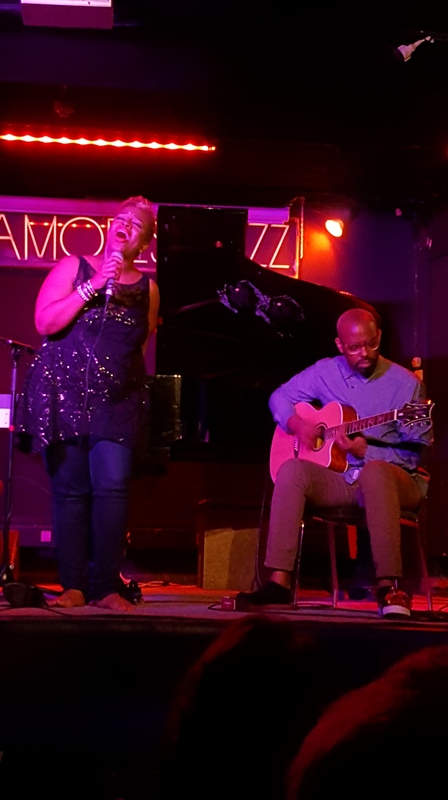 She sang mainly repertoire from her two albums – Avery *Sunshine (2010) and The Sun Room (2014) – and a little tribute to Aretha Franklin as well as Maroon 5’s Sunday Morning. And how she sang: powerful and quiet, full of emotions and in total control of her instrument – if you think India.Arie and Hil St. Soul, that’s the kind of quality you get with Avery, telling her own stories through her songs. And got the audience captivated from the first to the last minute, singing along whenever requested. She as well introduced 3 new songs to the small, but enthusiastic audience and especially JUMP sounded great and fresh – the Ice Cream Song was as well really cool and charming and the last of the new ones was like being in Church in a way: a gospel-like showpiece of her voice and an invitation for the audience to participate. This was helped and improved by the presence of a choir in the crowd – GOSPEL FACTORY – and at one point Avery asked them out in front of the stage and they sang with her – simply gorgeous!!! She ended the night with ‘You’ve got a friend’ and the audience gave her a well-deserved standing ovation. Watch out for her – Avery will bring sunshine as well to you soon!!! Great voices to look out for … there will be a new album by Gregory Porter in late May and I am sure it will be as good as the previous one, judging from the first single, which is already out – Can’t wait to hear the full record. 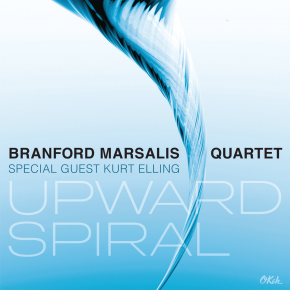 The Branford Marsalis Quartet has teamed up with Kurt Elling for UPWARD SPIRAL, a fantastic album coming out June 10, followed by an European summer festival tour. Paula Grande has finally released her cool first album Viatge Interestellar and is performing the music around Spain at the moment – she will be in Madrid May 19th and I am looking forward to hear her and her band to perform these songs. And there is a new live DVD (her first) by Melody Gardot, which I am going to check out in the coming days. Great voices – great music!